Daily Archives: 29. listopada 2017. 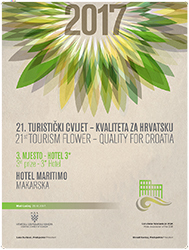 Awards in the Tourist Flower quality for Croatia were awarded to hotels in various categories, from luxury to business and holiday resort hotels. Hotel Maritimo won 3rd place for the best 3 star hotel in Croatia.